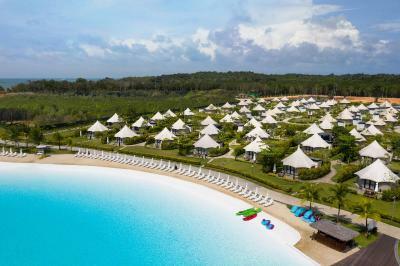 Lock in a great price for The Canopi, Bintan, A Tribute Portfolio Resort – rated 8.6 by recent guests! The staffs are extremely friendly & engaging .. feel happy at all times .. double thumbs up for that! The Canopi is as it is per describe in its website .. love every inch of our 2 nights stay! The peaceful ambience makes it a great way to escape from the busy city life. Super friendly staff, good breakfast spread, and spacious unit. If you have the time, spend half a day tour to the city area to explore bintan. We love the lagoon and the buggy service staff were all very nice and friendly. Whatsapp within the resort is a good way of communication. Activity centre staff provided good service too. I like the environment of The Canopi..is so comfortable and beautiful!! All the staff there very nice and helpful. I very appreciated the services. It's so chilling and every staff in Canopi is so helpful and friendly. They even remember your name. Great place to take a break from the busy work. It has activities that is different from other resort. Love the environment and the room setting. Staffs are friendly too. Big props to Suparno & Angga from the hotel staff team. These guys know what geniune friendly service is all about. The surroundings are lovely, plus the experience of glamping! 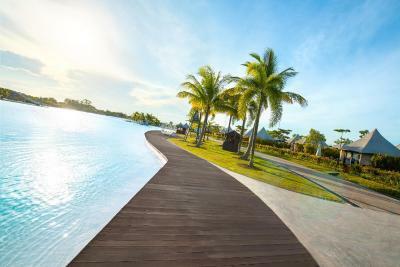 The Canopi, Bintan, A Tribute Portfolio Resort This rating is a reflection of how the property compares to the industry standard when it comes to price, facilities and services available. It's based on a self-evaluation by the property. Use this rating to help choose your stay! Offering a private beach area and the largest outdoor pool in Southeast Asia, The Canopi is located in Treasure Bay in the Bintan Region. There is a restaurant and guests can have fun at the water park and games room. Featuring views of the lagoon, the rooms at The Canopi have a flat-screen TV. Some rooms include a seating area to relax in after a busy day. 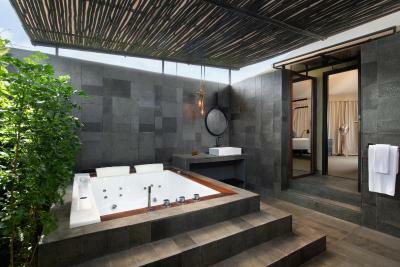 Certain rooms have an outdoor whirlpool or views of the garden. 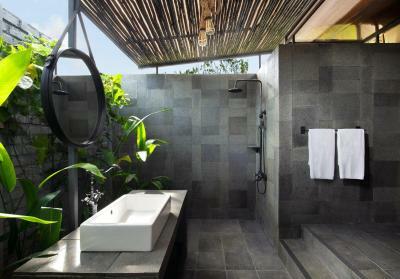 All rooms come with a private bathroom fitted with a standing shower. You will find free shuttle service at the property. Other facilities include a tour desk, a gift shop and meeting/banquet facilities. 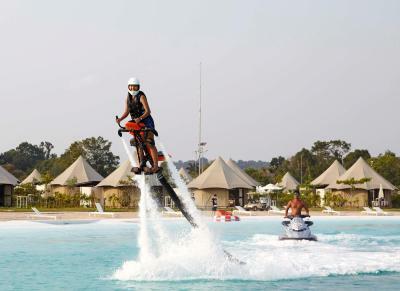 Guests can also enjoy a variety of water sports facilities. A range of activities are offered in the area, such as snorkeling and windsurfing. The resort also offers bike hire and car hire. Tanjung Pinang is 19 mi from the property. This property also has one of the top-rated locations in Lagoi! Guests are happier about it compared to other properties in the area. This property is also rated for the best value in Lagoi! Guests are getting more for their money when compared to other properties in this city. 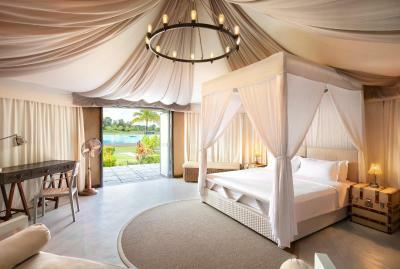 When would you like to stay at The Canopi, Bintan, A Tribute Portfolio Resort? This double room has a sofa, patio and electric kettle. This double room features a cable TV, tumble dryer and electric kettle. This double room has a mini-bar, seating area and electric kettle. This double room features a seating area, tumble dryer and view. 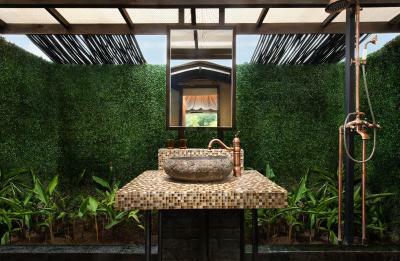 House Rules The Canopi, Bintan, A Tribute Portfolio Resort takes special requests – add in the next step! A IDR2000000 damage deposit is required on arrival (around USD142.00). This deposit will be fully refunded 14 days after check-out, as long as there isn't any damage to the property. The Canopi, Bintan, A Tribute Portfolio Resort accepts these cards and reserves the right to temporarily hold an amount prior to arrival. Please note that the lobby and The Patio Restaurant will be undergoing renovation works from 20 September 2018 until further notice. During this period, guests may experience some noise or light disturbances, and some hotel facilities and services may not be available. A damage deposit of IDR 2000000 is required on arrival. That's about 142.00USD. This will be collected by credit card. You should be reimbursed within 14 days of check-out. Your deposit will be refunded in full by credit card, subject to an inspection of the property. Only 1 restaurant at Resort. Better to have a day pass for activities, expensive to pay for each of them. Garden tent is very beautiful & spacious. Lots of Water activities & other Land activities at Treasure Bay, suitable for family. 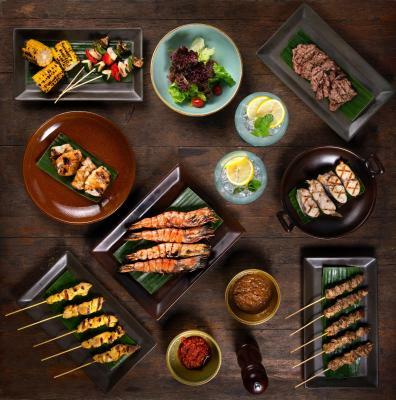 We have 16 people & enjoy our bbq dinner with assistance of the professional chef at garden. Avocado and scallop salad was less than desirable. It was iceberg lettuce galore with a minimal scattering of tomato, avo and scallop. Could have been better. Australian sirloin steak, while cooked to order was super chewy, less than desirable. We had a tent on the edge of the property, Unfortunately it was right next to a construction zone. While it finished at 9pm it wasn't ideal when trying to put two kids to bed. With two young kids the resort was easy to get around and had plenty of things to do. There's something for everyone! Kids menu is good. We wish there were more things to do in the resort. It is relaxing and beautiful. Perfect for weekend trip. Food price is too expensive and is not nice at all. Bbq, lighting is too dark and there’s so many mosquito had a very bad experience as the food is really awful considering price of almost SGD100. The place is clean and quiet for peace of mind to relax. The only transportation to the city area is taxi, which costs way too much. The crew at Canopi are amazing bunch of people! We have water activities as one of our team bonding elements but 2 of my staff could not swim. Thank you to the thoughtful lifeguards, Hendri and Dedi, who not just safe guard their safety but also enhance our team bonding activities by making it even more enjoyable and filled with laughters and joy! Also, thank you to our housekeeping crew, Asrafil, for helping us out with catching the baby frog which happen to be in our bathroom immediately upon receiving our call. The whole team at Canopi are the best of best team anyone could ask for at any resort! Thank you once again! Delayed check in and lack of spa facilities. Cleanliness and upkeep of the place. Warm staff. Overall very comfortable place to stay. Staffs are friendly, cleanliness is up to standard, food is very nice. Have to wait for quite a while when checking in as there was a mix up of room type booking. Booked a lagoon view tent but in the system, it was booked as safari tent. Staff were quick to rectify it. But upon checked in, we found out that the bath mixer were faulty and the aircon system keeps on turning off intermittently. Was given another room after our dinner. The distance from my room to the restaurant and lobby was within walking distance. Staff were very helpful. Wonderful selection for breakfast. The spa massage was good and value for money. A little pricey and perhaps if the tents could be a little more soundproof would be good. I can hear the sounds from the TV in the next tent blasting at me. Beautiful well maintained lagoon and the overall place. The Housekeeping staff Nur is very friendly to my girls. Overall we enjoy our stay. This is the 2nd visit 4 months. The Staff was very friendly and courteous. Always a smile onbthe faces even thise you passed by. Makes for a pleasant and happy stay.